WHAT HAPPENED TO DAVID A. CASTRO? Hey, the Lord said to do this, to tell the report, so here it is, for those that like truth. 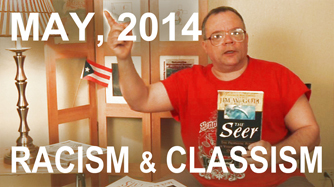 The TRUE SEER is a Puerto Rican From the projects of Brooklyn, NY. 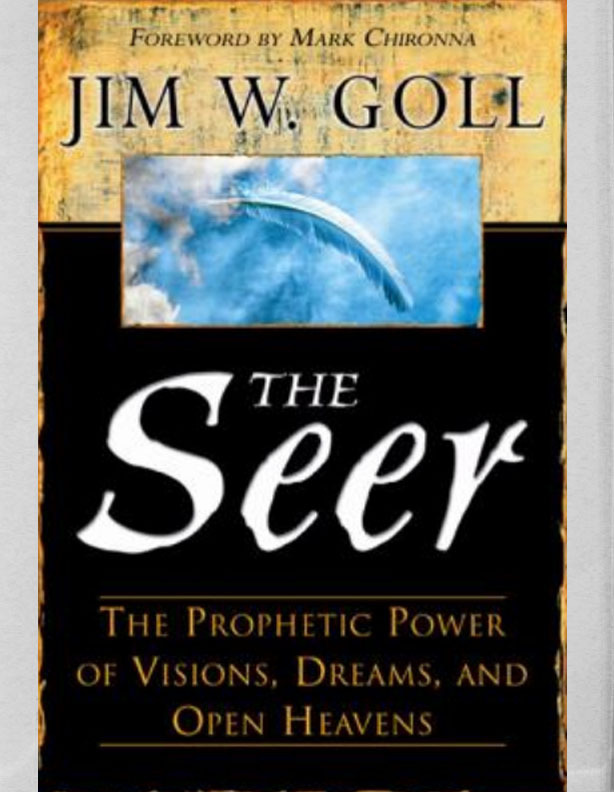 Who is the true author of THE SEER? YES, JAMES IS A FRAUD, accountable to no one! When I met James W. (Jim) Goll and other “Kansas City Prophets” in 1991, they were enchanted by my anointing and impressed with my DREAMS book. 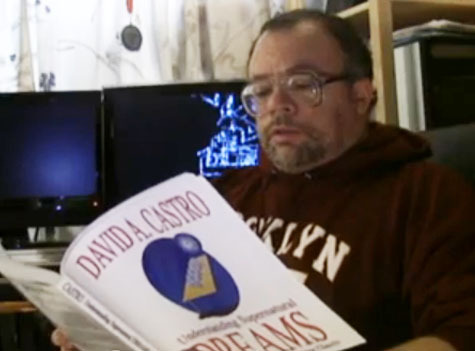 Until about 1997-98, Jim praised my DREAMS book and my VISIONS book to many people, saying that my books are the best on the topic of supernatural dreams and visions. So there are many that know that Jim's classification of 12 LEVELS OF SUPERNATURAL VISIONS" is actually David A. Castro's original work. I'm still waiting for someone to come forward and admit the veracity of my claim. Over time, Jim used a lot of my original research as his own and enriched his teaching and books with it and has made a grand career as a prophet and author. 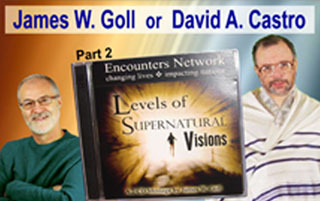 The 2-Part audio series, "LEVELS OF SUPERNATURL VISIONS" is actually Jim Goll's reading from my 2nd book "UNDERSTANDING SUPERNATURAL VISIONS ACCORDING TO THE BIBLE." I did not give him permission to do this, he did not credit me or inform me about it, we are not friends, and HE HAS AVOIDED ALL MY ATTEMPTS AT COMMUNICATION FOR OVER A DECADE. 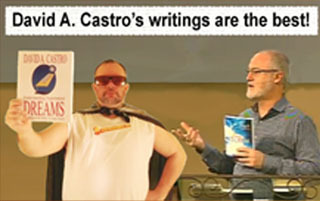 In July 2013, the Lord told me to make known what has been done to David A. Castro Ministries, and address Jim's plagiarism. This is why I wrote “The Prophet From The Projects: a memoir from the mentor." As you listen to the 2-Part audio above, read along the .pdf file of my second book, which was originally written between 1989-1990, and for which James wrote the Foreword in 1994 (while we were still friends). I highlighted in yellow the parts that Jim quotes verbatim. In 1993, he wrote a ringing testimonial endorsement for the DREAMS book, which you can read here. Further, in his 2004 edition of THE SEER, James W. Goll (on pages 130-133) quotes a couple of paragraphs from my first book UNDERSTANDING SUPERNATURAL DREAMS ACCORDING TO THE BIBLE, A LIVING CLASSIC (the manuscript of which he originally read in 1991), but references them in his End Notes as being from my second book UNDERSTANDING SUPERNATURAL VISIONS ACCORDING TO THE BIBLE. In THE SEER link below, I highlighted what he directly quoted, and what he suggests that he wrote but actually re-worded. 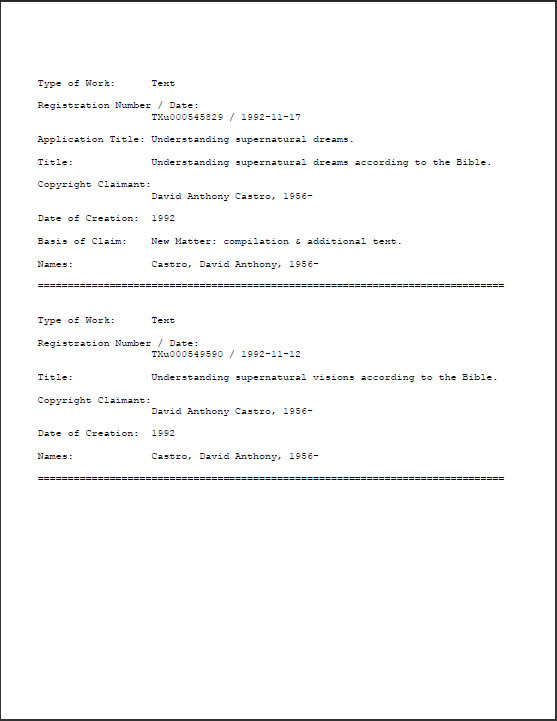 If a person reads from my first book and compares it with these pages from Jim’s book, they will see that he changed some words around but left a lot of evidence that he copied from my material, such as the list of ecstatic experiences on page 132, (Mark 5:42; Mark 16:8; Acts 3:10; Luke 5:24-26). They are in the same order as in my book and with the same ideas, though occasionally slightly re-worded. (Compare with my excerpt here.) He does this sporadically throughout his book, but I have gotten so disgusted with the impure activity that I refuse to address every instance of the plagiarism—James has so tainted the holy theme of the supernatural. I waited for over a decade to tell the world that Jim was using my material, but I just didn't know how much he was doing so. I was wailing and waiting to exhale throughout, but wouldn't dare until God released me. He released me in 2011, but I got really scared of the potential backlash that I did nothing. July 2013, He (GOD) again speaks like a trumpet blast from Heaven: "NOW IS THE TIME," so here I am. I simply want the world to know the truth. My book ministry has been like a wife to me, which Jim killed, according to a vision I had on Saturday morning, September, 13, 2008. My civility prevents me from speaking more plainly, but God is a God of justice and He sits high but looks low. There is nothing that escapes Him and there is no respecter of persons with Him. Jim had a ministry of prayer but was always interested in supernatural experiences. When we met in 1991, he celebrated me and my anointing and my Dreams book. 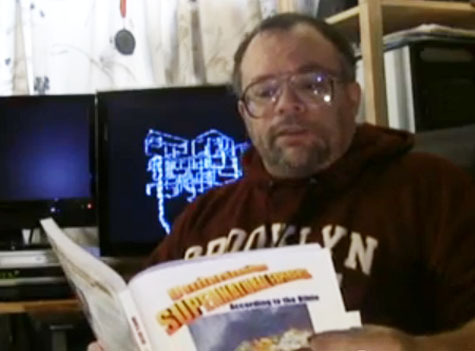 Within a few years, he began secretly taking from my first 2 books and using them in his books and lectures, especially in his series THE SEER. He mentioned me only rarely, and only in the 1990's. He was very careless in his deed, as will be obvious to any casual reader, because he was in a rush to publish his books; that season--the juncture Y2K 1995-ish to 2005-ish)--saw an extraordinary move of God around the world, a vital component of which was the theme of supernatural manifestations, signs, wonders, visions, dreams, trances, etc. An unprecedented number of people from many nations hungered for these things and for understanding along these lines, so many writers addressed the need. Illegitimately, James did his part. He wasn't satisfied with his own products, but secretly bit off mine and got propped up as a prophet of the divine. He taught about "holy watchers" (angels) but dismissed them when robbing my property and enabling the decline of my ministry. He has forgotton that the arc of the moral universe is long but bends toward justice. If it were a secular matter, it would still be quite disgusting and audacious to take as much as he did, as obviously as he did. That it is spiritual content on holy and divine themes, and that he can perform publicly and without shame around the world as if there’s no wrong done, makes it incredibly indefinable and absolutely unacceptable. It is out-of-this-world outrageous. That so many people are enriched by THE SEER series reveals the hunger in many pure hearts for the pure, legitimate, true supernatural anointing. What will those hearts think when they learn that one of their greatest proponents is a fake? Many good people were shocked that the great Prophet Bob Jones was guilty of sexual misconduct, and became hurt and confused when it was announced that the great Prophet Paul Cain was a homosexual and a drunkard. 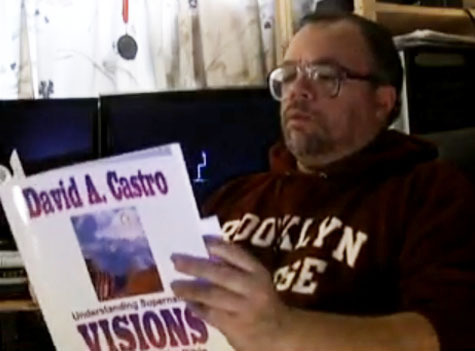 Now they will be sobered to learn that their great mentor in the prophetic has done this great evil, to a true prophet-seer of divine revelations: David A. Castro, the prophet from the projects of Williamsburg, Brooklyn, New York. In my naïveté, I was puzzled for years when no one (Jim’s ministry peers that know me) responded to my calls and book promotions. Now I understand that Jim kept them in his corner and away from me. 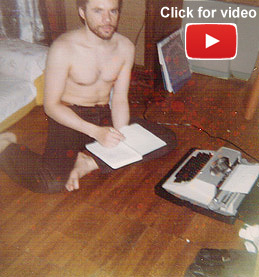 I didn’t know that Jim was plagiarizing so much until 2009, when he ran from me in Long Island. I hadn’t been in touch with him for over a decade. 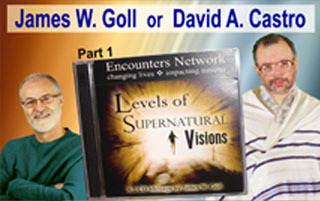 I bought his 2-Part audio CD message “Levels of Supernatural Visions” and discovered that he plagiarized almost my entire 2nd book, “Understanding Supernatural Visions According To The Bible." Will someone please ask Jim, "Who created the classification of 12 Levels of Supernatural Visions?" My Visions book (originating in 1989 and copyrighted in 1992) richly elaborates on those 12 kinds of visions since I, the true seer, teach from personal experiences with the divine along with a scriptural understanding. In 2011, the Lord said, “IT IS FOR THE GIFT THAT I SHALL RELEASE YOU.” I was unable to do or say a darn thing. In July 2013, the Lord said, “NOW IS THE TIME,” so I wrote my 7th book detailing what I know. I hurt and sweat and cried for years, waiting for God to address the issue. Now, I ain’t sweatin’ no more. I’ll just tell it, including to our blessed President Barack Obama and others that love fairness, justice, and righteousness, and let God do whatever He wants. People, get ready. And all you ministers out there, particularly the so-called “apostolic, prophetic, extreme prophetic, supernatural dreams and visions and signs and wonders” community that saw nothing of James W. Goll’s deceit and destruction of David A. Castro’s ministry, I am ashamed of you all. I am unbelievably ashamed, and happy to be distanced from you. I will continue to do God’s will in other communities. Nevertheless, an invitation to repentence and contrition is hereby extended, for those that would humble themselves and come clean. By the way, Jim and his peers--who know of my monumental contribution to the themes they propagate--just happen to be conservative rich whites; I was penniless in the projects for a very long time, barely surviving and on Food Stamps. Ha ha ha ha ha................. They shut me down hard. Though not entirely a racial matter, the race/class component is too obvious to ignore. From “THE SEER” by James W. Goll, pages 115-133. The parts taken from my book have yellow highlights in the left margins. By the way, he made a few mistakes: on page 121 (underlined) he says, “In an apparition, an object, a place, a person, an angel, or Jesus Himself, might actually appear," but I wrote in my Visions book (on page 28, first paragraph), “In an apparition, an object or place cannot actually appear to a person, but a person, or an angel, or Jesus can.” James also discarded some of the richer elements of the concepts. They are not his, so he cannot describe, define, or defend them in-depth. He adulterated the rich revelation that the Lord has been giving me since I was saved by the Shekinah Glory in Aina Haina, Hawaii in 1979. For any sincere seeker, I and my books have not changed, and I am still generous with my time and prayers for anyone. Your kind servant in the projects of Brooklyn, davidcastro@brooklynblessing.com 1(347) 673-2843. I was saved by a glorious vision while alone in a Chinese Temple in Aina Haina, Oahu, Hawaii, in 1979. The Lord told me to return to Brooklyn, New York, and I started working for the Postal Service almost immediately. During my employment there for 3 1/2 years, the heavens opened in my life and supernatural revelations and experiences occurred frequently. God Himself anointed and taught me about these things without influence from ministers and doctrines. I became a church-goer in 1982 and then became familiar with books and teachings about the manifestations of the Holy Spirit. Rev. Kenneth E. Hagin and Kenneth Copeland became my favorite authors. After resigning from the Postal Service in January 1983, I did a lot of private biblical research and, in 1986, began producing teaching tapes supplemented with booklets, being inspired during a 2-month period of dedicated prayer, with some fasting. 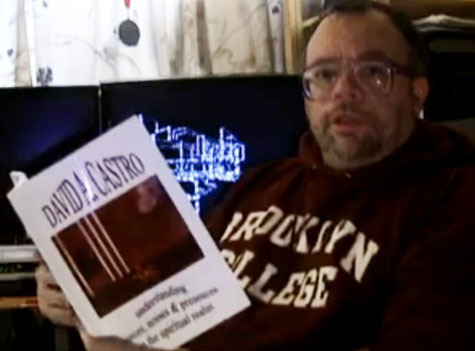 Those tapes, entitled "Understanding Supernatural Experiences According To The Bible" and "DREAMS: Understanding The Visions Of The Night And Their Interpretation," later became the source of my books. Interview on Urban Forum Radio Show. Along with other guests, I was interviewed by Chill Lover Radio's Urban Forum, and I talked about my first book. 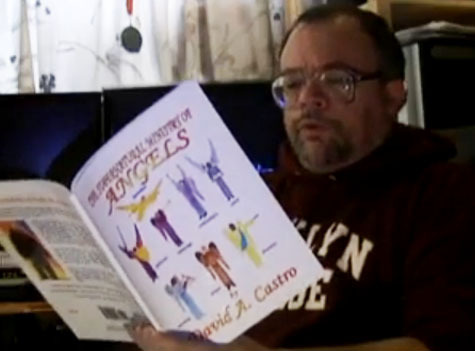 Thanks, hosts Silky and Paul, and Author Angel Huertas. The event was Angel's book signing for "Rise To Grace," at Harlem's Hue-Man Bookstore. 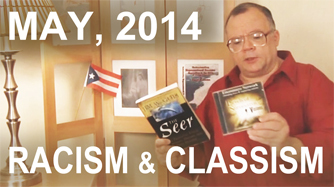 Here are some videos of readings from my 6 books, published by Amazon/CreateSpace. A brief introduction to my six books and the history of my publishing efforts. 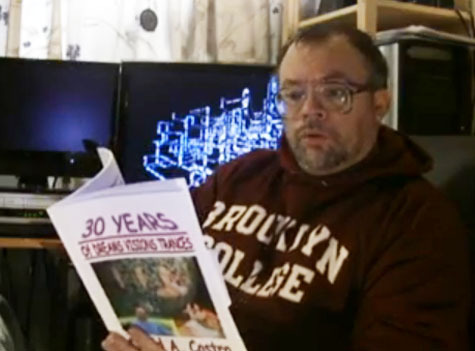 Readings from my first book, the original notes of which I began compiling in 1985. Readings from my second book, Part 1. Part 2. Part 3. Readings from my third book. Readings from my fourth book. Readings from my fifth book, Part 1. Part 2. Readings from my sixth book.